hello, i was kind of hesitant about posting my question, but hell...no1 on here knows me, so here it is. in my line of work, i need "ALL" of these things: protection from the law, protection from evil and wicked intentions, like rapists, robbers, people throwing things, etc. i need men 2 b attacted 2 me, while bein generous and spendin their money(less work 4 me),with no hassle. I work at nite, so u probably can c y i need so much! ONLY GOD CAN JUDGE ME. omg @j82! anyway thanks. but i was wonderin shud i do oils and powders or an all purpose mojo hand. wouldn't spells b more time consuming and expensive if i were 2 order kits 4 each purpose? Since you stated that you want to accomplish quite a few things, some work is going to be involved. You don't have to buy all the spell kits at once if you're worried about the expense, but like it or not, spellwork can be expensive and it will be time consuming. What I would do if I were you would be to work on empowering a piece of jewellery for each purpose. Annoint and empower something with Cleo May oil and Look Me Over oil to attract the attention of men, another with Fiery Wall of Protection, another with Money drawing etc. You can empower each piece by placing it in font of a candle annointed with the same oils, and place your petition beneath the candle and the jewellery in front of it. That way, you can wear the jewellery as you are working, and won't have to worry about putting effort into maintaining a spell while you are working. You should dress the items with oils to keep empowering them about once a week or so. I hope that at least gives you a few ideas. In any case, wearing a few bangles won't look too out of place. Another thing too: good on you for doing whatever you need to do, whatever it takes to support your family. Who are we to judge? Not everyone has it easy. thanks ever1 4 ur great info....aaaand hey its not wat u do, its how ya do it! jus a lil sumthin i've learned. o yea thanku 2 notdoriangray. Do you carry a purse? You could create a mojo bag, and keep it deep in your purse. Elder flower, and oregano are both great to keep away criminals, and the law. I would put in a john the conqueror root, and put in those herbs as well with some fiery wall of protection sachet powder. You could make a spray with bath crystals such as fiery wall of protection with some holy water, and insert elder flower and oregano. ad about protection spells, not uncrossing spells. o ok good lookin out starsinthesky! So I'm strongly considering a temporary career as a bail bonds enforcement agent. (also known as a Bounty Hunter). What kind of spell would one use to aide and protect a bounty hunter? 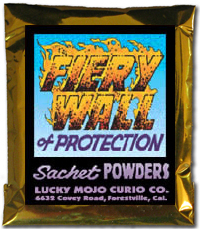 Fiery Wall of Protection products would be excellent for protection - you could carry the Triple-Strength FWP Mojo bag with you as you work. You could also use Master products, perhaps mixed with a luck product to help you be totally in control and command of the situations, and get lucky breaks and hunches that could be of aid. could also be of considerable aide--Consideration for bringing someone "to justice" when there is just cause. Master Key heightens the senses, from personal experience keen heightened awareness. Fiery Wall of Protection(most important) is an absolute must.. Devi gives great advice. In addition, Saint Michael is the patron Saint of Police Officers; you will probably be licensed or bonded in your profession for purposes of the law, I would pray to Saint Michael for protection from those who are harmful. Fiery Wall of Protection and the invocation of Saint Michael seem like great idea for such a profession. I'd also recommend Crown of Success to help you be successful in your career and John the Conqueror to help increase your personal luck, power, and physical prowess. You might consider combining divinatory methods into finding the people you are sent after. Well betrayal is a part of life. The only way to get betrayed is to let someone in and unless you are willing to cut off the world it is unlikely that you'll be able to completely eliminate this facet of life. What you can do however is protect yourself. Working something like the Fiery Wall of Protection in which you name the black candle for those who betray you can help. This type of work will place barries of protection that will limit such occurances and will shield you from those who wish you emotional and physical harm. Remember it doesn't stop the betrayal but believe me, you will have a powerful shield against it. This post has a particular interest to me today. I have posted and deleted more than once. I got betrayed today. Shocked actually. I am sorry to hear that Triplethreat. Don't forget to give yourself some self-love. Like a Blessing candle, take a nice cleansing bath, and dress yourself with Victory Oil to overcome. Good luck! I second ConjureMan Ali, things like this happen! But remember the saying, 'a silver lining...' it doesn't seem like it at the time, but it happens, and follow the Blessing and Victory advice. Blessing and Victory to you Triplethreat! Thank you both! I am up before dawn and today is a whole new day! I am a firm believer in Trust and Loyalty and am fully prepared to cut ties with this person regardless of work relationship/friendship and Godmother to my child. I read the advice from both of you and agree and I also just received some peacewater. Im thinking of taking it into the office with my other supplies today. Although I should have seen this coming, the end result is that I am better off without this individual in my life. Most people wonder "why" when this happens. I knew the answer to that immediately-- Jealousy. Today will be a GREAT DAY!!! Thanks again Conjurman Ali and jwmcclin Blessing and Victory received. RedRose wrote: Id like to avoid betrayal in general is there anything I can do to hold this back from happening because there something about me that tends to attract this unfortunate sort of behavior, its becoming annoying but never the less is there anything I can do? When I talk to people who have something like this happening in their lives I will recommend as some of the other moderators did, Fiery Wall of Protection products or even straight up Protection products but I also recommend that you look at the people around you who have betrayed you and ask yourself why? Why have they done this? What are they hoping to gain? And have you in some way opened yourself to this kind of betrayal? Often I find that people who are generous, giving, trusting, and and open hearted lay themselves up more easily for betrayal than other, more guarded folks. That doesn't mean that you need to change anything about yourself--but it might mean that you need more wisdom and discernment when picking (and dealing with) friends, family members, and co-workers. To that end I would recommend King Solomon Wisdom and Clarity products as well--may you see clearly into people's true intentions and respond with wisdom. As a final thought, if you have suffered betrayals again and again you may have established a pattern that needs to be broken--i have seen it before. If you feel like that applies to you then I would recommend Cast Off Evil and Healing formulas as well. If you aren't sure and you feel like you need more insight, get a reading from one of us at AIRR. Miss Bri, thank you for posting this. I was betrayed horribly today by my boss, her boss and a co-worker. I so needed to see this! While this has cut me to the core when I am already vulnerable, it does bear warning. If you are the type of person who gives and gives and gives, and like myself, you know no other way, you NEED to protect yourself! I have been using Archangel Michael for protection for my son and myself for quite some time. I have set up an elaborate protection bowl for him and a packet for myself. I also have ancestors and other spirits that walk with us for protection. With Archangel Michael I pray his standard prayer but also ask to be protected from lots more on the emotional, mental, physical and spiritual realms. I have problems with no dreams and Ms. Cat said my level of protection may be causing this problem. Well it seems that I may be keeping other things away from myself and my son including people and spirit. My son has friends in class and at lunch but as soon as he goes outside for recess no one will play with him. No dodge ball, no jungle gym, tag football so he just walks around. It came to my consciousness through spirit as I was trying to figure out why this was happening and confirmed through divination. That it is to keep him protected. It would be like a mom wrapping her kid in a bubble suit so her child can't get hurt but can't run outside and play either because of the suit. Can this be because my protection could be keeping away anything that could possibly cause harm including people and spirit? Has anyone else had any experience with this or can provide guidance? I'll see what the cards say too. I hope I put this in terms that make sense. I am going to restate my prayer in a different way and do some spell work. Any suggestions on the spell work? You answered you own question, BestOfLife / Scratchmade Sweets. There is not just one factor in a protection spell. 1. The concept of protection (which you are asking about). 2. The power of your own gift in this specific area and your ability at the time and place where you did it (which is enhanced by the products you used). 3. The Prayer itself (what you meant by the words). In this case it seems you did not consider the effects of 2 and 3. Think about what you mean when you pray. If you believe that all people are evil then a prayer of "keeping all evil away" may result in socal isolation. If you think that money is basically evil...well you get the point. Rethink, find out what your beliefs are at this time and once that is done you know how to change the prayer and the spell. I may have thought the evil thought in regards to the school environment without realizing it. oops. I will definitely think back to that time I started and be watchful of how I pray for protection, as it is an ongoing thing. I did a divination and found out that was the case...that my work had actually placed a barrier around my son at school. I guess I had been looking at the children there as "bad @ss kids" because of the issues he's had, LOL. Things have changed so drastically since I have did additional work and changed my prayer. I did a honey jar and dust him daily with LM attraction powder, crown of success oil, fiery wall and love me oil (so others will find fondness/love for him in their hearts). He actually has a great time at school now! He has nice friends in class and on the playground now. These Lucky Mojo products are outstanding. It's like a complete 360! I am being thrown at, and cleanse and protect myself daily. However, what was headed for me seems to be attacking my bf and his family. A spectacular run of bad luck, including unexplained illnesses and his sister being laid off out of the blue by her formerly untouchable company. How can I protect them, too? Especially if they don't want to be involved in the work(s)? They are Catholic, but respect what I do - they just don't want to do any 'magic', even Christian. Any suggestions? Offer to buy saint candles to light in their house, and fix them -- with oils only, which won't show. Next time you go to their house, slip a little Protection Oil into their cleaning products, laundry products, and/or grooming supplies. Pray over, and dress with protective oils or powders, any pictures of St. Michael or St. Barbara that they have in their house. If they don't have any, give them some -- fixed as elaborately and sneakily as you like. Set lights for them in your own house or on a rootworker's altar. Invite them for a meal of foods seasoned with protective herbs such as garlic, basil, etc. There are some fine recipes in the Hoodoo Foods! recipe booklets. If they like bath salts, give them some protective bath crystals, possibly mixed into homemade "bath bombs" (instructions all over the internets), but definitely repackaged. Pray over protective amulets and give them to your boyfriend and/or his family as "good luck charms" or even "just jewelry." If they are devout, saint medals might be just the thing. I have given this gift to friends and family who are having a bad run of it. I will take and evil eye disc and paste a Teotoikos image to the back of it with the face looking through the amulet. I will also give them an evileye amulet keychain to protect them while in the car. I tell ladies to hand the key ring on their purse. When I paste the icon onto the amulet I say something like "Evil fly by this is the not the house /person or car you are looking for. The eye of Mary see who sent it and she remembers everything." I have had good luck with it plus they are really pretty and unique. I've been making some boxes to store my different hoodoo products, supplies, and workings in, but I wanted to put some extra protection on it. I was wondering what you guys would recommend (which products, etc.) that would be effective adding a bit of security. I want to protect it from both people meddling in it physically (which, I figured, I could just lock it up or hide it away, but I'd prefer not to have to do that every time I leave the room), and anything else, be it tricks or spirits, that may come it's way. I'd appreciate any thoughts on the subject. Law Keep Away will keep your things away from prying eyes. Put a bay leaf in each corner of the room where you do your work; it doesn't even have to be in plain sight. Indian Head pennies: the Indian serves as a lookout. The traditional way is to put them on the door frame, but you could put one on/in the lid of each of your boxes. 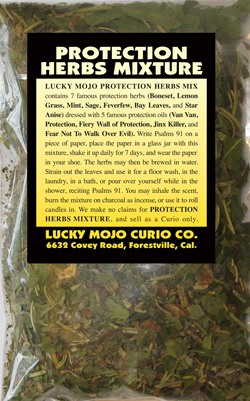 And I gotta second the recommendation for Law Keep Away; it contains not only "nothing to see here" herbs, but also "AAAAH! RUN AWAY!" herbs . This made me seriously laugh out loud. My son's father is not particularly active magically but he is obsessive with talismans, oils and extensive feng shui. He feels like he can be as evil and hurtful as he wants because these objects protect him from karma. I am trying to do some work against him to get my son and myself free of him but am encountering a lot of blocks from these protection items that he employs. It was confirmed in my candle readings. Do you have any advice to get around the protection that he has set up? All of my readings are showing that my work is just and my methods are correct, just that they are encountering a lot of blocks and deflections. Thank you for all suggestions! Do a Road Opener for yourself. And Fiery wall of protection spell on yourself as well. Against the man obsessed with protection, go buy some Destruction oil, Dark Arts oil and burn black candles dressed with the oils against him, with the specific petition to destroy the protections he has in place. If he's got protection doing direct works of attack can send the mess right back at you. It is the very point of protection. You either want to strip him of that protection or have someone skilled enough do the work. My friend did a honey jar and the next couple of days have been horrific. She is dating a man who is divorced but now he has been off and on with a female for six years. He told her it was over, but since she did the honey jar on him he has sweeten up a lot. They have been dating for a year now. This past Sartuday, her child almost set the kitchen on fire, she woke up and put the fire out. Later on that morning she had to drop her sister off to the airport, and an 18 wheeler jumped and slid right in front of her car trapping her and others in a blockage of this truck, and gasoline was dripping. She called her boyfriend to come to her aid. Everything is okay with her, but when I spoke to her, her speech was rushed and she was studdering all shook up. I told her to STOP the honey jar cause maybe someone was working against her. I thought you only had to use protection when you were doing dark work??? OK-I am confused by your post so you will have to bear with me...at first it sounds like your friend just started the honey jar and then had crazy things happen to her, then it sounds like your friend has been doing the honey jar for a long time and has had positive movement from it...so my first question is...when did she start the honey jar? If she has been working the honey jar for a long time then its highly unlikely that the events she experienced this past Saturday are related to that work at all. Now, they may or may not be related to her situation-if he was stepping out on her with other women and now he has returned one of the other women may have a problem or it could simply be a couple of weird and scary things happening. She would need to get a reading to make sure. As far as your question about protection-some folks keep protection on them at all times. Some folks do "dark" work as you call it and they don't do protection at all-though most people who do darker work do cleanse themselves (and of course make sure that they are justified in doing it.) For instance, I do lots of love work for people but I still have a protection regimen that I follow every single day. No she had not been doing the honey jar for a while she had just started it, she was only a week into it when all of the chaos started for her. I do know that she fights over this man with another female who is nuts about him. He is divorced and this other woman was an off and on girlfriend of his for about six years now. My friend has been with him for a year now. They found out about each other. My friend popped up over his house one day unexpected and caused a scene and she, was confirming to his other woman that she was his girlfriend by showing her his lovey dovey texts he had been sending my friend back and forth ,the previous girlfriend was screaming and crying and very upset about it. My friend told me that he was a single man when she met him, or so HE says! From my understsanding it is three days for a sign, three weeks for movement and three months for completion? I suggested a reading and I directed her to this site. I suggested a honey jar but I didn't know these results would follow behind them shortly. That's kinda creepy two bad things happening like that back to back. Your child almost burning up your kitchen while your sleeping, and then and eighteen wheeler sliding over into your lane and blocking you in while gasoline is dripping from the truck. My friend called me from the hospital barely able to get her words out. I have stopped work on trying to reconcile with Dear One. We have been chatting as friends on FB and occasionally catching up. But now his GF is focusing on me. I know she has huge anger and hatred toward me. This is not an overstatement if anything it is an understatement. The house is protected as part of my practice and I do cleansing regularly. Last Wednesday I had an abusive phone call from (I believe) her, Dear One found out, as I had complained to a friend, and he confronted her, she denied it was her (so it would be a friend of hers), but she told him she took a drive passed the house. He was furious. Absolutely furious. Saturday night she sits outside my house for 20 or so minutes until Dear One turns up and then they start fighting in the street. I listen for another 15 or 20 minutes and then go out to remove them. I watched her carefully and when she opens her mouth to speak I realise I'm almost 100% sure it was her on the phone, she was also preparing to become violent. She says some things, nothing exciting just I'm 'in her place' and to 'back off' and Dear One agrees with her. Here's the thing Dear One has contacted me quite a few times since. First time (Sunday) apologising, second time (while he was on holidays with her) just to check up on me and hear my voice and the third time today (Friday). Phoning to talk. I have told him I am in danger from her. I am. I know I am. I "saw" this happening and the danger feeling is just about driving me batty. I am wanting to move. I need to move. At least the neighbour isn't around , so now if I could do this to her. he's in so much trouble with her. I am his friend but I tell him, you need to delete any comments, any records of contacting me. I also advise him that as much as we care for each other we can't see each other as she will lash out. I want to protect his son (stepson). I would love to protect Dear One but she is his choice. He knows he is in trouble with her, and he knows I am in trouble as well. He had to delete me from FB, she has been stalking me from her account and friends accounts. Not that she can see anything as my privacy is really high and I blocked her but she uses other friends accounts. I have removed at least one of her friends from my business FB page. My main aim is to keep protecting myself and my children (my stepson included). I would like several strong tricks to keep her away from me until I can move where she can't find me as easily. I would like something to protect his son. The protection is working to a point as she doesn't seem to be able to step foot on my property. She parks outside it, but hasn't gotten out of her car, and with the fight she moved a few doors down before stepping out of her car. At this point I am really after revenge. She has angered me, trying to control ME with her tantrums and threats. I really don't need this rubbish. I stopped working on him and instead of easing off this seems to have incited her more. I know that this woman, even without strong personal effects, is easily affected by work. I am almost tempted to start work on breaking them up again just to make her life hard. I would like to see her life slide and even though I am not normally one to condone it I am wanting her to start drinking again. Actually, she already has but it's the 'occasional drink' as she 'can control' it. So maybe I should just leave that. She seems to have a lot of success, she gets extremely well paying jobs and has a book that she is meant to be working on, draft of the first 3 chapters are due at the end of this month. I would love to see that book fail. I would also love to see her new job fail as well. She starts that Monday. I am feeling rather jinxed at the moment, this year has been difficult to say the least and I can't get a foot right. I have been cleansing, using hyssop, herbs and Protection Oil, I think I have missed something somewhere though. I have advised Dear One that if she returns to my house I will call the police and I will protect myself physically if I have to. Any more suggestions on what I may do? I am feeling quite vengeful. And it hasn't really dissipated over the week, I have been trying to let it go. You could hot foot her away - while doing a moving candle spell with her going away from you, and your guy coming closer to you. Like they drift apart because she got some great opportunity elsewhere. Then you could use a skull candle on her to make her forget about you - not see you as a threat. But first, just for fun, you could do that parrot feather spell so she will blab all the wicked things she is doing to you in front of her boyfriend and he will see what a hateful nutjob she is .... just some ideas. LOL, oh Moonbeam, she has blabbed to him about what she does. He has been fully witness to it. He is also aware that she is a nutjob, and a liar but he either believed or maybe still believes that it can be controlled. All I know is that if he isn't at the house with her, i have no doubt someone will be checking up at my place to see if he is here or not. I am not trying to reconcile with him, I would just like to remove her from MY life and protect my stepson. Hotfooting, I have tried hotfooting with her, but she seems to be tied to this area (owns her house, daughter, she can't move away from the area due to the daughter) chances are if I hotfoot her she will end up in the same city he would love to go to anyway. Maybe use a skull candle on her and put ideas into her head. I really like skull candles. They are very effective. Maybe I should use Inflammatory Confusion on her to up the anger between the two of them. And just make it harder and harder for them to be together. Get her agitated and keep my protection really high. Work on her insecurities so she can't bear to have him do anything unless he is within her sight all the time or at home. I know her sister lives there now so maybe somehow add that. Trying to think outside the box at the moment. First, I think that all of your ideas are good. And you know how I LOVE the skull candles! This last link has some good cursing stuff. I will definitely look into those spells, see what I have on hand to start on them. The goofer dust will be deployed soon. I will make a poppet as well and start work on that. Really, you shouldn't mess with anyone that uses magic. A purse or a womens hand bag, of course men can carry one in a jacket or a suit, and some places make tiny psalms books that can be carried easily in a pocket or a mojo. The gideon bible or those small tiny bibles passed out freely to people which contain new testiment and pslams also would work in your pocket. during a house move i forgot a protection bottle behind, which used to be in my front yard. This got me thinking; what happens if a protection bottle breaks? this is a witch-bottle containing urine, nails, pepper, four thieves vinegar, fiery wall of protection oil, aimed at capturing spells thrown one's way. Would it be paranoid or stupid to think that the spells thrown at you which your bottle protected your from would be let out once the bottle loses its effectiveness? Another question this episode got me thinking is the practical aspects of house moves ...how would you move all your work, especially freezer spells? I think that if your protection bottle were to break while you were living in the house that you would just find yourself vulnerable to whatever someone might throw at you. For that bottle spell you left behind I would not be overly concerned about. Anything it coughs it has likely neutralized. Just set up a new bottle for your new home. In terms of moving your work, put your fozen stuff in a cooler. I think you just have to do what is practical depending on what it is. Every practitioner does things differently. So, it's hard to tell what was actually done. The red stuff could be anything. So after 8 months of working on reconciliation, I finally reconciled with my boyfriend and we are now together. However his ex-girlfriends who he only dated for 5 or 6 months (also lived with him) keeps reaching out and coming back because she needs help. He feels bad not helping her because she literally moved from another city to move in with him, she is back to her state but keeps coming back for her stuff little by little and stays for days in his house. Today, I had a reading and things will stay firm between my boyfriend and I. He is done with her and he is sure of his feeling for me. Anyway, the reading said that she is planning on a ways of how to make him keep helping her, and possibly some magic work. I want to block her from our lives and stop bothering him or making feel guilty or like he needs to helps her. I have most of the supplies I need from LM, but I am not sure how to use the herbs or exactly what to do. I want to block her in case she is doing or planning doing work ( what should I do?) Baby doll, mirror box, not sure what would be best to block her. But I did placed a picture of her in a ziploc with white vinegar and 4 thieves vinegar and froze her. I want her to stop coming back, reaching out and bothering my boyfriend for help (I did separation work and hot footer her, but not sure I did it right) I just used a black vigil candle one for her and than another for both of them. I added inflammatory confusion oil, separation oil, hot foot oil, poppy seed, brown mustard seed, and hot foot and break up sachet powers. Is that okay? I also want to protect our relationship from getting harm, and I want to protect us from her. Should I do one black candle for both? or one for each? Is Black okay for protection or can I use a white vigil candle? What kind or herbs and oils do you recommend me to use? I have a honey jar for him just in case too. So he is loving and kind. And I also do red vigil candle with love herbs and oils to reinforce our relationship. Is that okay? I would really appreciate any advice on this. Mostly if is very specific instructions because I have a hard time comprehending. Why not try doing some work on the girl's behalf to help her move on? Do work to help her find a good job ( back in her state ) and to find a new love back there too. If she has good income, she won't NEED help from your boyfriend. If she has a new love, she will be focused on him, not your guy. A candle moving spell where her candle moves farther and farther away from your boyfriend's candle, and closer to a red male candle representing her new love could help. Burn a Steady Work candle for her too. If you help her, you help yourself. Thank you Moonbreath and Miss Aida!! !